E.B White has said that “the essayist is a self-liberated man,” (104) but for Charles Doss this was only literally true once, when, in August of 1974, he escaped from the Arizona prison where he awaited his pending execution, punishment for emptying the contents of his revolver into the back of a fellow student during college registration. Even then, saying it was the essayist who liberated himself is not quite true, because Charles Doss considered himself a poet first. It wasn’t until later that year, recaptured and secluded in a basement cell only fifty feet from the execution chamber, that he began reading Shakespeare and Dickenson, becoming so consumed with poetry he felt it was his life calling. “Until that hour I don’t think that I had ever written a poem,” he writes in “Poetry as a Life Force,” the opening essay of his book I Shall Mingle: Essays and Poems. “On the first morning, I wrote ten sonnets. These I sent to ten selected publications, and five of them were accepted” (8). When he liberated himself he was not yet the writer he would become, and this self-liberation was not the type he would ultimately have. Though his execution was eventually stayed, his actual liberation never happened, and in August 2001, age 65, he died in that same prison. In truth, I may be doing Doss a small disservice by having his first scholarly debut label him as an essayist rather than a poet, or even more broadly, a writer. Yet Doss twice won Honorable Mention in the annual PEN Prison Writing competition (1991, 1992), but he won in the essay category both times, not in poetry. He did call himself an essayist at least once, but more importantly, by his own admission he doesn’t always understand his poems, nor know where exactly they come from. In a letter to his friend Donna Miesbach (written some ten years after the above essay was published), he claims that his poems come to him from God, and describes leaping awake with “a poem in my brain, entirely written, word-for-word, and it was necessary for me only to write it down” (Letter Dec 14 1997). And so, while the poems are enjoyable, it is to his essays that I turn to understand the prisoner and his struggles. Often, in the tradition of the essayists of old, his essays seem like friendly letters, the cheerful confidences of an old friend. Many, I think, had their first inklings in letters. “One of the many things in this beautiful life that brings me much happiness is writing letters to people whom I don’t know,” Doss writes by way of introduction to his essay “To Weather Every Storm Together.” Though the writing and reading of poetry is the leisure activity which Doss has chosen, his willingness, as he writes, to “examine my mind” makes him an essayist, as well. And, more to the point, his essays better show the qualities of freedom and leisure which are the subject of this essay. More than just having the qualities of freedom and leisure, the essay is the literature of freedom and leisure. John Neulinger points to Seneca as one of the first leisurists, who thought of leisure in a constructive way, different from the rest of Roman society. “The majority of Latin authors,” Nuelinger writes, “conceptualized leisure (otium) in terms of rest and recreation, thereby defining it as a type of nonactivity rather than by its intrinsic qualities” (4). This otium is the leisure intended for most prisoners: it is inactive, time consuming but not self-building. It is the quality of creating that makes Doss and other prison artists unique. In making such a connection to Seneca, Neulinger also inadvertently mirrors essay theorists, who also point towards Seneca as the carrier of the essayistic tradition, whose letters, Phillip Lopate writes, “both Montaigne and Bacon cited as their inspiration and which remain his most attractive and accessible work. Essays in disguise” (Lopate 4). And I’ll explore further the connection between the essay and leisure theories by meandering through the academic, the theoretical, the philosophical, and even into the correctional to look at the essays of an inmate with no freedom and with leisure options so constrained as to be almost anti-leisure. It is painfully obvious at times that Doss is aware of the physical freedom he does not have, of the difference between himself and the people on the outside. Take for example his essay “Time Stopped at Twilight,” published in The Christian Science Monitor in 1980, a few years after Doss’s sentence was changed to life, and a year or so after I Shall Mingle was published. The first sentences draw us immediately to the space of the prison: “At the west edge of the prison is a chain link fence to which I was drawn, day after day, for a period of weeks. At this fence I can peer across a field at ‘the world,’ which lies about 200 yards away” (20). As is Doss’s wont, he describes himself sitting at that barrier, observing the world beyond it. There is no freedom here, the essay itself begins with this boundary, and we the readers are painfully aware that we are part of that “world” on the other side of the field which is on the other side of the fence, which, we can imagine, Doss pokes his fingers through as he leans against it, staring out at us. But, being an essayist, he doesn’t stop at this fence, but escapes the prison, letting his mind go free where his body cannot. He describes a certain evening at that fence when, looking out, he sees a couple sitting on a porch in the distance, and suddenly feels a connection with the man. “If there is no man but Everyman,” he writes, “then how could the man that I behold be anyone other than myself? And if there is no time but the present, …then I was gazing at a moment that belonged rightfully to us, every time.” The “us” he refers to is he and his wife, and in the essay he imagines them sitting together, enjoying the kind of quiet moment you might assume they would have if different choices had been made. It is Doss’s ability to see beyond the fence that first convinced me he was worthy of further study. I found his book in an antique store and picked it up only because I always give any book with essay in the title at least a glance. From the cover—dull green with just an embossed title and author—and a perusal over the table of contents, with essay titles that didn’t do much to excite, I didn’t think it would be much good, but it was only $1, and having a book from a murderer seemed like an interesting addition to my library. But when I started actually reading the essays and poems, I saw Doss’s ability not to dwell on the tragedy of his situation, but on the world around him, and on his thoughts. He could, as Benson writes of all worthy essayists, create “a companionable treatment of that vast mass of little problems and floating ideas which are aroused and evoked by our passage through the world” one who can “impart a certain beauty and order to it” (np). That this beauty came from inside the dusty brown and gray enclosure of prison seemed all the more remarkable. After reading the book, I was interested to find out more. But the only thing I could find on Doss was a web post about him, written by Miesbach, a nice, elderly lady who had corresponded with him for a few years while he was in prison, from whom I learned that “it was during his time in solitary confinement that he turned to writing poetry” (Miesbach). His two collections of prose and poems can be found for sale on various online used book stores, but there are no descriptions of the books and no comments. The only review of I Shall Mingle that I can find is the one I wrote on Goodreads, and of his other collection, Treasured Writings: Poems and Essays, I have found only used-book listings. The front matter of I Shall Mingle writes that his essays and poems were originally published in The Christian Science Monitor, where I found “Time Stopped at Twilight” and a few other essays not in I Shall Mingle. But that’s it. If there was a critical reception of any kind, it’s buried deep. Doss himself writes that “the literary works of a man spending life in prison do not first cause much of a stir in the hearts of publishers” (I Shall Mingle xiii), and it would seem the same could be said for readers. But age adds intrigue, and I looked for more of his work and more about his life: about Doss specifically, I found very little. His prison records are old enough that they aren’t online yet, with the exception of one court opinion, which describes in sterile language the fight he had with his classmate, only hinting at the sexual innuendos flung towards Doss about his daughter, and then the resulting shooting, which Doss claimed he committed in a moment of temporary insanity. About his essays there is nothing: the only academic mention I found was in the bibliography at the back of H. Bruce Franklin’s Prison Literature in America, but even there, the publishing information didn’t match the front matter in my book, and the only “annotation” was already in the subtitle, “Essays and Poems.” I had hoped to find some discussion of Doss’s trip to the Philippines, which he mentions fondly so many times, including descriptions of the marketplace where he met his wife. Or some discussion of his quiet contemplation, of his compassion for his fellow inmates. But, instead I found only surrogate discussions, discussions of other prisoners’ work. And while there is no literature about Doss, there is a great deal of academic discussion of the literature written by our prisoners. I say “our” because they belong to us as Americans, especially. Quoting journalist Scott Shane, Richard Shelton said, “With a record setting two million people now locked up in American jails and prisons, the United States has … a higher percentage of its citizens behind bars than any other country” (Shelton 52). Not only do we have the highest numbers, but according to other statistics, “1 in 32 US adults are either in jail, on probation, or on parole” and that we as Americans house about 25% of the world’s prisoners (Miller 2). While many free people will say that they aren’t the reason the prisoners are in jail, that their own choices put them there, the truth is that we as a society have come to accept the prison system how it is, though there is surprising evidence to show it creates more crime then it prevents and that the recidivism rates are possibly as high as seventy percent due to a system that perpetuates imprisonment rather than prevent it through education (Bunyan 181). But I digress. Graham Good, in discussing the rise of the essay with the rise of the novel, compares the essayist to common tropes of early novels: the knight and the rogue: “Like the [knight and rogue], the essayist goes out onto each foray, physical or intellectual, into an open world where almost anything can be encountered. But generally his adventures do not involve the physical violence that constantly befalls (or is inflicted by) the knight or rogue” (Good 10). But, sometimes his adventures do involve the physical violence of the rogue. For example, sometimes the budding essayist, when taunted by a classmate who had slandered his daughter, leaves the college registration line, goes home, gets his revolver, and returns to the college cafeteria with it in his briefcase. When this happens, the school security guard, knowing there had been a fight earlier, may confront him and ask him if he meant to do anyone any harm, which the he will deny. Then, when the guard leaves, he sometimes walks up behind his subject and empties the rounds of the revolver into his back, a day in his essays he only hints at, alluding to “storms” (21) and “a great misdeed” (28). “I am not a criminal,” Doss told Miesbach in his letters. “Rather, I’m a man who committed a very criminal act, in response to extraordinary provocation from a notorious bully, during a time of grievous mental illness that no longer exists” (Letter 6 Feb 1998). He told her this in 1998, twenty-five years after entering the prison, as he also told her that his parole had been denied. But, despite E.B. White’s assertion about essayist’s freeing themselves, turning to the essay never did allow Doss any social liberty, though he and others had hoped that his impressive and exhaustive writing would prove to a parole board that he was ready to return to society as a productive member. While Doss is the example for this essay, prison literature is growing in interest and any number of writers could be chosen for this study. If he were writing today, Doss would no longer be able to say that no one is interested in his work, because there are more and more organizations willing to support imprisoned writers and their work. “Prison literature is also becoming the subject of college courses, and there is a desperate need to provide a forum for the criticism of prison literature that can explore its variety and articulate its meaning in a variety of contexts” Miller writes, calling prison literature “at once a literary cause for celebration and a social tragedy” (Miller 3-5). As our cultural awareness becomes more keen on the voices of the marginalized, the voices of the forcibly marginalized are also shining through. Men… told me that for two to three hours each week they could be free…For those hours, if the workshop met, they could treat one another with respect and affection, regardless of their color or background. For those hours they could discuss things that were very dear to them without fear of being ridiculed or ignored. And if I couldn’t get in, the workshop couldn’t meet. It was as simple as that. They would have no freedom that week (Shelton 104). Shelton is describing an important part of the perceived freedom of leisure, the freedom from fear, the freedom to respect and be respected, the freedom to be a whole self. Theodor Adorno calls the essay “free, the freest form in all of literature” and “a form that is itself intrinsically formless.” But the most important part of this freedom is what it builds—it will be the same for leisure—“the personal essay…build[s] its own structure as it moves along, rebuilding and remaking itself—and its author—each time out” (11). It is this re-creating of the author that makes the essay the ideal literature of freedom, which is why so many essay theorists focus on the self and persona in essays: Graham Good writes, “The mixture of elements in the essay—the unsorted ‘wholeness’ of experience it represents—can only be held together by the concept of self” (8). Phillip Lopate writes that “the essay is an enactment of the creation of the self” (xliv) and John D’Agata adds that “it’s a mind’s inquisitive ramble through a place wiped clean of answers. It is trying to make a new shape where there previously was none” (5). While the form is important to the essay’s freedom, its real connection to leisure comes in the act of becoming a new person through the act of essaying. This re-creation is also the goal of recreation, and is, in fact, where the word recreation comes from, this discovery of self. Neulinger points out that this shaping is one of foremost importance in leisure studies: “A number of themes stand out: leisure has potential for self-fulfillment, personal growth and creative expression; leisure permits personal autonomy” (Neulinger 12). He also argues that while leisure has this potential, it also has the ability to challenge and disrupt society, for good or for ill. How the individual chooses to use free time ultimately effects the benefits society gets from the individual, whether that is productive, destructive, or just bland. In essays as in leisure, the individual holds the responsibility for these societal transformations. This is why we put people in prisons: we assume that any influence they will have on society will be negative, and so we attempt to remove their influence. But art, with its distaste for borders, doesn’t hold much to that and can influence us anyhow, and so prison artists like Doss are able to make positive contributions to society even as they pay a debt to it. And this idea carries over into essay theories, as well: “The heart of the essay as a form is this moment of characterization, of recognition, of figuration, where the self finds a pattern in the world and the world finds a pattern in self” (Good 22). But, in leisure and essay, though it is the individual who must make the decisions, society still has a strong sway on what those choices should be. In fact, one of the most common complaints about modern leisure choices is that too many people have given up their individuality in favor of consumerist leisure, the prepackaged thoughts and thrills that offer no real freedom, only momentary, mindless escape. Leisure studies may not have taken up the formal study of the essay yet, but essayists long ago took up the informal study of leisure. Many of the first popular periodicals publishing English essays took the wandering muse as their moniker: The Idler, The Rambler, The Spectator, Table Talk. The editors and writers, even from these earliest iterations, saw the way an essayist must somehow stand apart from the rest of the bustling crowd, moving not from business to business, but “proceed[ing] at things ‘haphazardly, eyes closed,’ a rambling and playful spirit” (Ouellette quoting Chestov 97). Michael Hamburger writes that “an essay is a walk, an excursion, not a business trip,” and, likening the subject of the essay to a field, adds that the essayist has “no intention of surveying it. This field will not be ploughed or cultivated. It will remain a meadow, wild” (91). Alexander Smith tell us that “an essayist plays with his subject” and claims that the essayist is a “chartered libertine” (np). Emphasizing this free and ephemeral nature of the essay, William Dean Howells writes that an essay’s form obeys the laws of “gypsy music” with “wandering airs of thought” (36). Besides the common rhetoric of describing the essay, leisure has also been one of the favorite topics of the essayist. One could fill anthologies of idle essayists writing about their idleness: Montaigne’s “Of Idleness” and “Against Idleness,” Chesterton’s “On Lying in Bed,” Cowley’s “Of Solitude,” Jerome’s “On Being Idle” (collected in his book Idle Thoughts of an Idle Fellow), Lee’s “About Leisure,” Morley’s “On Laziness,” Repplier’s “Leisure,” and Robinson’s “An Apology for Idlers.” And if we catalogued every mention of a leisurely activity embedded as a motif in an essay ostensibly about some other subject, we’d have enough examples of essayists being lazy, idle, or leisurely to fill archives. Though he mentions leisure activities, Doss’s main concern in his early essays is his impending death in the chamber, which he muses over not for its own sake, but as the day when he will no longer be able to write poetry. “The deadline I work against is a terrible one,” he writes, “but it doesn’t distract in any way from the bittersweet pleasure of the task” (11). In a sense, all artists and creators are working towards that same deadline. The prisoner on death row has the unfortunate case of knowing how, why, and when—to the minute—that deadline will come. This is how Doss’s essays portray his leisure time, with hints at activities throughout texts about other subjects: In “Poetry as a Life Force” he discusses reading (I Shall Mingle 9-10); in “To Weather Every Storm Together,” letter-writing (I Shall Mingle 19); in “The Earth as a Poem,” lying in darkness, only listening (I Shall Mingle 27); in “The Philippines of Our Soul,” remembering previous travels abroad (I Shall Mingle 37); in “When the World and I Were Children…,” remembering childhood fishing and movie visits (I Shall Mingle 41); in “Learning the Beauty of Nightlight,” remembering bike rides and stargazing with his children (20). These are all examples of the way the essayist, even when in prison, turns to leisure, recording for his reader the moments of remembered and current leisure, even when those leisure options are only lying still in a dark bunkhouse or walking around a hot, caged Arizona yard. But, until that time comes, Doss has little else to do but be idle. Philip Lopate, remarking on Robert Louis Stevenson’s “Apology for Idlers,” writes “Substitute ‘essayist’ for ‘idler’ in Stevenson’s passage, and you have a catalogue of the genre’s virtues: curiosity; openness; appetite for pleasure, willingness to reflect, to give oneself to ‘random provocations,’ nature, beauty. All this adds up to the capacity for perception…By Stevenson’s logic, only the idle person is able to practice seeing” (xxxiv-xxxv). The important thing here is not just that the person is idle, but that the idleness gives them an ability to see, a quality necessary for all art, especially the essayist. It is that ability to see in idleness that allows Doss to observe, “Defenseless little kids are what I so often see, where others see hardened criminals. I don’t claim to be ‘right.’ I don’t even know if the word ‘right’ has any validity in this instance. I only seem to perceive the quantity of little boys who find themselves wearing labels—and chains—because they lacked the ability to ask in a coherent and acceptable way for love” (I Shall Mingle 50) that he was different somehow from these little boys because “other men in my position create nothing and desire to create nothing” (I Shall Mingle 11). He recognizes his own creative spirit, his capacity for seeing, even as he pities those who don’t possess such a spirit. Perhaps this is what John Neulinger was getting at when he said that “the primary dimension of leisure, then, is freedom, or, to be more specific, perceived freedom” (15). Doss’ letters to Donna Miesbach still long for a literal freedom, a freedom he said he would use to tutor disadvantaged youth. But even lacking that ability, he still created a freedom for himself around his writing, aware that his capacity for creation made him different from the average prisoner around him. This recognition brings into play Graham Good’s description of the essay and freedom: “Freedom is the essay’s essential mood and quality, in that the essayist is free temporally (he has leisure), spatially (he can walk and travel), economically (he has at least a ‘sufficiency’), but most of all mentally (he is unprejudiced, curious, observant about himself and the world, quick to respond to new experience and new ideas)” (Good 11). For Doss, much of this wasn’t true at first glance, stuck as he was in a prison, but essayists generally fit this category. For Doss, the most important part of Good’s observation is the statement about the mentality. Naturally, essayists will have to use their leisure time to write, but none of that would have happened if they hadn’t used their capacity for seeing, as Doss does. It is not just that one must be idle in order to see, but that one must have the capacity for observations, because it is only in that capacity that the essayist can come to new conclusions or can take old ideas and give them back again newly minted. “The essay aims, in other words, to preserve something of the process of thinking, whereas systematic thought presents a fully finished and structured product,” Good writes (20), and Ramsay echoes this idea, though he is discussing leisure: “In play and leisure we can reach the freedom which consumerist society still dreams of, mythodologises, even fetishises – but meet it not by buying better things or adopting a socially approved lifestyle, but by our willingness to encounter and be changed by the deep meaning of the natural and personal world around us” (3). In this way, both leisure pursuit and essaying—when they are done for their own sake, for the gathering of individualism more than for reaching after certain facts, as is the case in consumer culture and the worst academics—are re-creation, literally the remaking of a self. It is only by using real, contemplative, re-creative leisure that the self can truly be formed and thus, can truly achieve freedom through new ideas. Ideas that are generated in the state of perceived freedom Neulinger described. Of that perception, he said, it is “a state in which the person feels that what he is doing, he is doing by choice and because he wants to do it” (16). It is this idea of perceived freedom that I want to consider: as you will see, there are leisure opportunities for prisoners, and if, as Ozick suggests, the essayist’s genius is “bound to leisure, and even to luxury, if luxury is measured in hours” (156), then the prisoner, who has nothing but hours, even days, months, ten years to life, is living the most luxurious of lifestyles, one that could potentially be the food for the richest of essays if the idlers there choose to use that time for such purposes. Knowing that leisure time can have this re-creating effect, where the prisoners are effectively given time and resources to do the higher-level leisure of education and self improvement, one might think that prisoners would want to make use of their time to re-create their life—many outsiders, at least, think that is the reason the prisoners are in the correctional facility to begin with. But, in truth, very few people, inmates or otherwise, actually use their free time to that end. Speaking about this free time, Carroll Hormachea (writing in the 1970s, about the same time Doss was publishing) said that “In 1943, Clemmer reported that 44% of the inmates’ time was available for leisure activities. Today there is probably a greater percentage of time available for such pursuits. Recently, in one penitentiary the inmates indicated that during the winter season they were confined in their cells for fourteen hours a day” (62). Another study looked not just to quantify the time, but to determine what sort of activities were happening. Frey and Delaney found that most inmates don’t actually participate in the recreational programs, and that “the recreational activities in which inmates do participate are generally passive [TV, reading] rather than active [sports, education, cards]” (87). And, perhaps more depressingly, the study surmised that prisons continue to support recreational programs not because they are of any benefit in correction, but because “tensions within the prison can be kept at a reasonable or controllable level as the result of an extensive recreation program. Thus, the significant role of leisure within the prison is not rehabilitation, but the safety of the institution” (82). As Bunyan claims in his essay “The Space of the Prison,” this play of power, of controlling rather than improving, is the main design of prisons, where the presence of the guards, the organization of the compounds, and the flow of goods and services are all carefully controlled. This control would have especially been needed in Florence in the ‘70s. Shelton describes getting caught in one prison riot, possibly in 1976, though he admits to not being sure of the date (89). Later, he writes that in “1977…seven inmates were murdered and twenty-four were stabbed…The image that the men in the workshop came up with most often was a tin can, getting hotter and hotter” (97). A number of riots that year closed the prison down to visitors. Doss’s record shows that he participated in a riot early in 1975 (Information), but Shelton suggests that many of his writers didn’t participate in the riots, since then they would lose their writing workshop privileges. Shelton’s record makes in unclear when the riot he experiences happened, but during the riot the workshop participants protected him, and it is a good thought to think of Doss among them, protecting the sacred space of the workshop from the violence of the yard. Violence that predominated the conditions Doss wrote in, but during that time that he was still able to write that “One of the many things that perplex[es] me is the striking fact that I am happy” (I Shall Mingle 37). One immediately asks how that can be, and Doss, ever aware of his reader, aware that the essay is not primarily a sermon but a conversation, tells the reader “You are privileged to ask that question; it is a fair one” (37). “There is no doubt that it is difficult for many to understand why an inmate who is incarcerated for his crimes should have any recreation in prison,” Hormachea writes, “Here again it must be realized that recreation is necessary because it is essential that positive leisure habits be installed in the inmate. Recreation also serves to relieve the frustrations of the daily institutionalized life that the prisoner faces; a life usually filled with both fear and resentment” (62). Bunyan echoes a similar idea, but gets more directly to the point: “If the inmates are evil, then they are not human, and so we, the public, need not worry about possible human rights abuses. All that we need is for prisoners to be punished and safely held in custody away from us, the good people on the outside” (181). It is the idea of being held away from us, the people on the outside, that would give Charles Doss the idea that no one would be interested in his work. But breaking that boundary is what causes his happiness. “I think perhaps I am happy,” Doss writes later in the same essay, “at this hour not only because my own soul possesses a Zamboanga [symbol from a poem, representing a Eden-like paradise] but also because I see it reflected so vividly in the souls of people that I communicate with” (38). This communication is exactly why prison literature is so powerful, and why the freedom of the essay exists even when found in the walls of a prison, where Doss has no room to move about or money to spend. And it is this communication that provides the freedom from the prison space. This is what Doss bittersweetly emphasizes in the ending of “Time Stopped at Twilight,” discussed earlier, where he envisions himself outside the prison. What does he do with that freedom? He pictures himself with his wife again, with companionship and quiet conversation. But the rest of the essay proves all too clearly that this freedom can only come through the imaginative act of writing. After he sees the couple and imagines it being him and his wife, he allows the haze of twilight to cloud his vision. He cannot altogether forget the pain surrounding his world, he acknowledges his “mere manness” and “waves of despair.” “This,” he writes, “is because I fear that in the pitch blackness I shall create no poems, say no words, feel no joy of life, have no knowledge of my companion with whom I share the shadows.” Then, he writes, the guard spoke softly, compelling him away from the fence and away from his revelry. But, even that cannot stop the outpouring of love, “You and I will share the twilight in spite of the efforts of all the earth to intervene” (20). This is where Doss probably feels the most restrained, the least free. In the prison yard he can imagine being with his loved ones, but he cannot be with his loved ones. But that imagining still holds power. As Bunyan writes, “love is effective as a strategy of resistance because prisons are not equipped to deal with such non-physical resistance and anti-criminal quality…Love, like words, bypasses the bars” (191). It sounds sentimental to talk about literature as love, or about some ethereal characteristic being a possible cure for the maladies of loneliness and boredom found in prison, but it is an idea that Doss agrees with—“The poet is a shy fellow, and chooses not to use the word love. But the essayist has no fear of it. It is dynamic in my life” (I Shall Mingle 49)—though I don’t know that he would have couched it in terms of resistance. But the fact that his collection is titled I Shall Mingle points towards this love, these immutable words, as his main purpose in writing, which he discusses in the collection’s last essay: “In this prison cell I am highly resolved that I shall touch humankind, that I shall mingle with the thousands. This I do in spite of the obstacle…and because of it” (68, ellipsis original). There was something about being isolated that changed Doss. “On death row, a number of forces—despair, hope, anger, resignation, frustration, and above all else love—came together in my troubled person and effected a healing process” (I Shall Mingle 17). This project cannot try to determine to what extent Doss was really healed or changed—such things can never be known and attempting to surmise would seem disingenuous—but I would like to point out one method through which a change may have occurred, namely the leisure hours he spent writing and essaying, an act that changed him enough for him to say, “From a man who had no purpose in life, I have become a prolific and dedicated poet and writer” (I Shall Mingle 16). A change he openly admitted came from the lonely months he spent in prison. A change in letting his mind sally forth when his body couldn’t, in the play of his thoughts. To finish, let’s return to the idea that one of leisure’s primary purposes is the re-creation of the self. Often, as I mentioned, this is to re-create the self as opposed to society, as an individual and not just an automaton. While all essayists are trying to do that in one sense or another, essayists in prison have a greater hurdle to get over, because they are already lumped with all the rest of the criminal element, a phrase Shelton writes “suggest[s] the monolithic view of those in prison—that they are all alike…but there is as much diversity among those in prison as there is among those on the outside” (117). It is against this mindset that the inmate seeks the most for freedom, against the hate of others such as Doss experienced when he first “stood manacled in a crowded courtroom and gazed around quietly. I saw contempt and hate in the eyes of total strangers…For many, many months I cried to myself: ‘But they don’t know me. How can they hate me?’” He continues, implying what writing has helped him see: “Then I stopped crying out and set myself the life-task of winning their regard. I refused to accept anyone’s verdict that I was, in truth, something other than a decent and an honorable man” (I Shall Mingle 49). In a very real way, it is his writing that makes him that man. Of course, we want to think he was “good to the core,” as the expression goes, but it is only though his mingling, via his writing, that he can change his persona as regarded by society. “All writers,” Bell Gale Chevigny writes, “may be said to struggle for freedom from figurative cages; in real cages, the urgency doubles while resources vanish” (247). And one of those resources is the society to which the convict used to belong but which, through his actions and our legal system, he has had himself removed. But the freedom to create allows him the chance to change that, to have the freedom to be his true self. For most writers, that may mean escaping an oppressive society, but for prison writers, that oppressive society offers far more freedom than the prison institution in which they already live. Thus, while both free and imprisoned essayists have the same goal, the ends will look something different: both are trying for the re-creation of self, but, unlike most leisure pursuits, prisoners gains a self in order to be acknowledged by society and to belong again, rather than to be set apart, which is often the goal of other contemplative leisure. All essayists, Lopate reminds us, are “tangential to the marketplace,” (xxxiii) but this is even more true of the ones the marketplace have forcibly removed. But, Lopate offers advice even for that writer: “The trick is to realize that one is not important, except insofar as one’s example can serve to elucidate a more widespread human trait and make readers feel a little less lonely and freakish” (xxxii). If all essayists know about being “lonely and freakish,” then the prisoners of our American system surely know that lesson the best, and in their writings, in their longing for human connection, in the companionability that has been a part of the essay tradition since Seneca, then they will be better able to teach us all how we can feel a little less disconnected. Towards this end, Shelton spends much of the first part of his memoir telling the story of Charles Schmid, one of Doss’s fellow inmates who would later be murdered in prison. Schmid was the first member of the writing workshop at the Florence prison, and he told Shelton, “What a beautiful feeling to work to create…to be happy. That in itself is a kind of poem…Oh Richard, thank you for bringing me to your world. I may not ever have a very big or important place in it…but at least I sense I somehow belong” (Shelton 19), which echoes the words of other prison artists: “If you make a painting or a photograph or music, you are something. You are someone, not just a number or a face” (Taft 14). This, ultimately, is the freedom of the essay. If, as Chevigny suggests, all essayists are writing from cages, then we all need the freedom and the leisure to look around us, to reach out through our bars and to become something, to re-create ourselves as people who belong with other people. All art will in some sense provide this freedom, but only the kind that does what the essay purports to do can really achieve the freedom provided by an individual self re-created and valued by others. Like leisure, though, essaying must be a choice. Whether our cages are literal or figurative, if we are to have the benefit of the time and space provided to us—however brief and however cramped—then we must learn to observe like Doss, who looks around and only sees “this world of steel bars and high walls and men with guns” and is still able to ask his readers “And what of you, who cherish your freedom? Are you quite as free as you might be?” (I Shall Mingle 50). If you do cherish your freedom but would like more, than you must reach out to others, as Doss suggests, and ask not what you can do for them, but ask that they respect you as a person, as an individual in need of love. This is what allows you to be yourself, which ever self you choose to create. Scott Russell Morris has a BS in Leisure Services Management and an MFA in Creative Writing from Brigham Young University. He is currently working on a PhD in English from Texas Tech University. 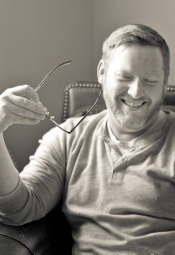 His creative work has recently appeared in Brevity, Proximity Magazine, and Blue Lyra Review. His current research interests are the junction between leisure and essay, especially the leisurely/essayistic pursuits of walking and cooking.